Haddock is a very popular food fish, sold fresh, smoked, frozen, dried, or to a small extent canned. Haddock, is one of the most popular fish used in British fish and chips. Fresh haddock has a clean, white flesh and can be cooked in the same ways as cod. Freshness of a haddock fillet can be determined by how well it holds together, as a fresh one will be firm; also, fillets should be translucent, while older fillets turn chalky (nearly opaque). Honestly, you can make Pan Fried Fish can be so easy.. 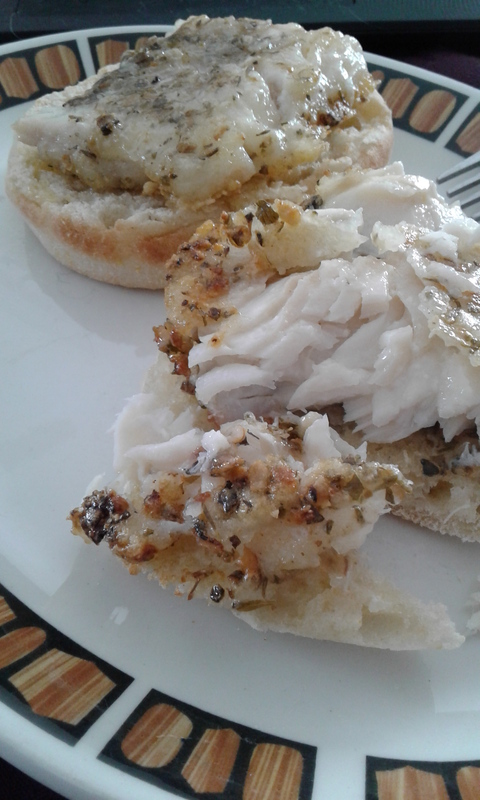 I just wanted a nice and easy breakfast, I took a fillet, mixed a tbsp. of herb and garlic spices with a tbsp of corn flour and dipped the fish into it and then into a med-hot pan with a bit of my home raised and processed pork fat heated up ahead in it.. Allow the fish to fry till it will slide easy and flip and for me, I like to flatten it at that point and let it crisp up on the other side..
End Result, a perfectly cooked crispy bits, soft sweet and flavourful flesh to be used as is or in this case placed on a toasted English Muffin. Always fully cook your fish.. please no under-cooked fish on your plate. I love to make this and then coarsely chop it up and put it over leftover rice made with a veggie broth. I picked up five kinds of fish and seafood to do a few recipes with, there will be some traditional, some very basic and some a bit more work, I have a friend who ice fishes so I am hoping to get to show local whole as well, but for sure once normal fishing season starts. I want to bring in a lot more fish recipes to the blog this year, hubby is going to be traveling up to the north and I am very hopeful a big old chest of frozen char will find its way back down to the farm and we will cure some, smoke some, and can a lot more for our use. 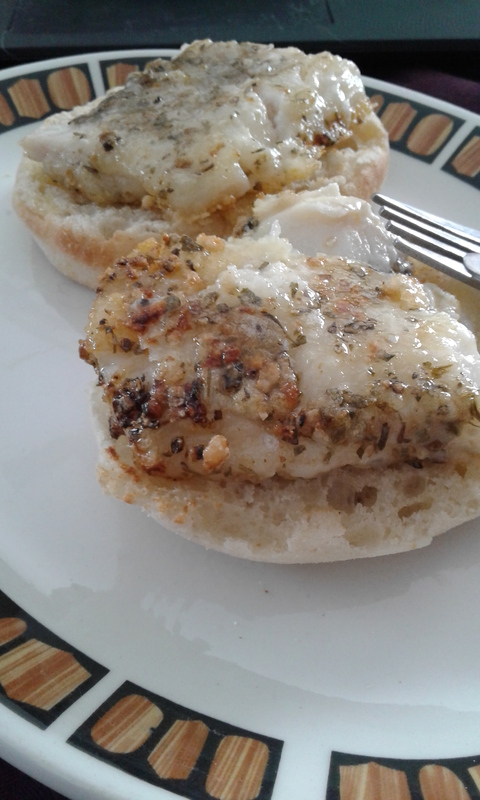 This entry was posted in Fish Recipes and tagged canadian Fishing, Farmgal recipes, Fish, Fish on the homestead, Haddock, Pan Fried Haddock Fish Patty. Bookmark the permalink. [D] As far as white fish go, J and I prefer Haddock to Cod. By Char I’m thinking you mean Arctic Char, which we can’t generally buy here in the UK. Is it white or ‘other’? It’d be good to read about how you do the cure/smoke! Hi, Yes, I do indeed mean Arctic Char, We lived in Iqaluit, Nunavut for five years before we transferred down and got the farm, and I loved the amazing amount of fresh seafood we could get locally from the Inuit hunters. It look very much like Salmon, so its a bright pink-reddish meat. Its outstanding s a cured-smoked fish, If I can get fresh enough, I will do my best to show how I was taught to do when I lived up there but its a touch tricky where I live now, we have night (instead of 24 daylight) and we live in a higher humid area then the artic is.. plus, up there, its never ending wind..